The Women’s Center will host its third annual Gender and Equity Research Symposium on April 16, 2019 with the support of several campus partners. For the first time, the symposium has a tagline: Practicing The Equity We Preach. The symposium will continue with community favorites, including poster presentations, oral presentations and a student roundtable. This year, boasting its third year of growth, the symposium includes some new additions, including IRB Ethics talks tailored for both undergraduate and graduate researchers, a spotlight on the WomenNC Fellows, including this year’s scholars’ research, and a ‘fishbowl’ open dialogue on medical ethics at the intersection of race and gender. NC State faculty member Marc Grimmett and student leader Jordan Bullock will be this year’s opening speakers. We invite you to join our Facebook event and check back often regarding our keynote luncheon speakers, to get reminders and to stay up-to-date on the symposium. 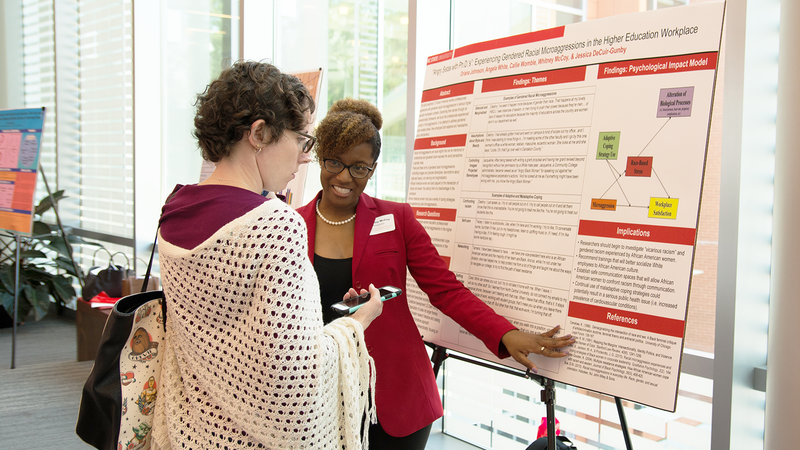 The NC State Women’s Center Gender and Equity Research Symposium was created to spotlight research that promote a more equitable and justice oriented society. The symposium, an initiative of the Women’s Center, bridges the interdisciplinary nature of gender and equity work at NC State by putting social justice and equity research into action and at the forefront of how we “think and do.” Students, staff and faculty from NC State and area universities, as well as community organizers and activists, are encouraged to submit proposals. Proposals for the 2019 Gender and Equity Research Symposium will be accepted until 11:59 p.m. on January 31, 2019. Find out more on our website, go.ncsu.edu/gesymposium2019 and submit a proposal. Submissions may address gender, intersectional identity and/or equity in research. Examples of research include race, gender, class, ableism and orientation, as well as the use of critical and feminist theories. Scholars from all disciplines are encouraged to submit a proposal. Research does not have to be completed by the time of presentation; however, you should note if you have not yet carried out research or collected data. Presenters will be notified of their acceptance by March 6, 2019. See Gender and Equity Research Symposium for more information about the event.